Integrate your entire TELUS Business Connect solution with mobile and desktop apps. You can set up meetings, access emails and make calls seamlessly from your computer, tablet or smartphone. Extend your TELUS Business Connect business phone system beyond your office. The TELUS Business Connect Mobile App provides you and your employees with easy and convenient integrated communications - anytime, anywhere. Now they can easily connect and collaborate through voice and fax. The mobile app is fully integrated with company directories. It allows individuals to see their contacts’ availability and eliminate phone tag or on-hold time. This new “Presence” feature shows the real-time status of co-workers’ extensions (busy or not) across all devices, including their smartphones and tablets. The new TELUS Business Connect mobile app also enables administrators to partition business and personal call logs separately for easy call tracking and phone expense control. The TELUS Business Connect Meetings Plug-in for Microsoft Outlook enables users to schedule or start a meeting directly from Outlook. To learn more and to add the plug-in, click here. Seamlessly integrate your TELUS Business Connect solution with Google productivity products such as Gmail™, Calendar, Docs™ and Hangouts™, as the hub of your business communications. Manage everything without leaving Google. Add the TELUS Business Connect for Google extension to your Chrome web browser by visiting the Chrome Web Store. 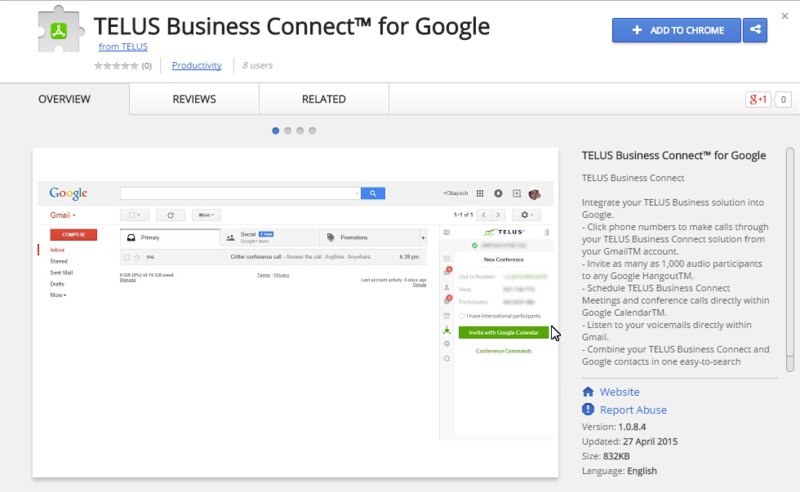 Once installed, TELUS Business Connect for Google integrates many productivity-enhancing features into Google. Download the user guide here. TELUS Business Connect for Microsoft Outlook fashions a powerful solution that gives Microsoft Outlook the ability to have all of your business communications in one place. You and your workforce can be more productive and work more efficiently. Make and receive calls directly from Microsoft Outlook or Contacts applications. Click to dial any phone number that appears in Microsoft Outlook or Contacts. View incoming caller IDs while working within Microsoft Outlook. View your complete communications history—calls, texts, faxes, and voicemails—from Microsoft Outlook. Combine TELUS Business Connect and Microsoft Outlook contacts on one easy-to-search screen. Schedule a TELUS Business Connect meeting or audio conference from within your Microsoft Outlook calendar. TELUS Business Connect for Microsoft Office 365™ creates a powerful best-of-breed solution that gives Microsoft Office 365 the best of both worlds: enterprise-caliber communications. With all of your business communications in one place, you and your workforce can be more productive and work more efficiently. Make and receive calls directly from Office 365 Mail or Contacts applications. Click to dial any phone number that appears in Office 365 Mail or Contacts. View incoming caller IDs while working within Office 365 Mail. View your complete communications history—calls, texts, faxes, and voicemails—from Office 365 Mail. Combine TELUS Business Connect and Office 365 Contacts on one easy-to-search screen. Schedule a TELUS Business Connect meeting or audio conference from within Office 365 Calendar. Enhance your Salesforce experience with seamless integration between your TELUS Business Connect phone system and your Salesforce CRM, improving workflow and increasing productivity. TELUS Business Connect for Salesforce ® works on Mac® and Windows® PC and now is integrated with Salesforce1 and operates with your iOS® or Android™ mobile devices. With TELUS Business Connect for Salesforce activated, you can place calls from within Salesforce by simply clicking on contact or account records. Your incoming calls trigger a pop-up window with the caller’s account information. Complete cloud-based app: no software to install. Access from anywhere on both Windows and Mac using any popular browser. Easy click-to-dial from within Salesforce by clicking on any contact, saving time and improving call efficiency. Instant screen pop-up with caller’s account records automatically displayed on incoming call. New browser tab for every call, enabling multiple interactions at once. Real-time call logs saved to corresponding Salesforce record with accurate call duration. New records–accounts, contacts, leads–can be easily created while on call. Integrates with Salesforce1 click to dial any number in the Salesforce1 mobile app to initiate calls using your RingCentral mobile app. Download the admin guide here. Business Connect for Skype for Business can help your entire company become more productive and work more efficiently by helping to bring all of your business communications together in one place. Skype for Business users can now leverage Business Connect to make and receive calls to any number using the latest WebRTC technology. Users can enjoy enhanced audio conferencing and online meetings with up to 1,000 participants worldwide. Enjoy reliable, clear calls directly within Business Connect for Skype for Business to any local or international phone number, not just your Skype contacts. Switch easily between calls with extended call control features, including one-click call transfers, Call Flip, call recording, and more. Choose a unique outbound caller ID for individual calls to meet your specific business needs. Start an instant Business Connect video meeting or easily share your screen with any of your contacts. Allow colleagues to instantly see your current availability within the Business Connect for Skype for Business app. Enhance your customer service experience, improve workflow, and increase productivity with seamless integration between TELUS Business Connect and Zendesk. TELUS Business Connect for Zendesk, you make or receive calls through the TELUS Business Connect phone system, directly from your account within Zendesk without the need for software. Make and receive calls through the RingCentral phone system, directly from your account within Zendesk. Work right in your favorite browser on Windows® and Mac®; no software required. Eliminate misdials with easy click-to dial buttons for contacts in your Zendesk account. Incoming calls trigger instant pop-ups, displaying matching customer records, so you’re ready to provide insightful customer service. With features like single-click dialing, screen pop-ups for incoming calls, automatic call logging, simple configurations, and much more, your sales and support teams can manage all call related activities inside Zoho CRM.